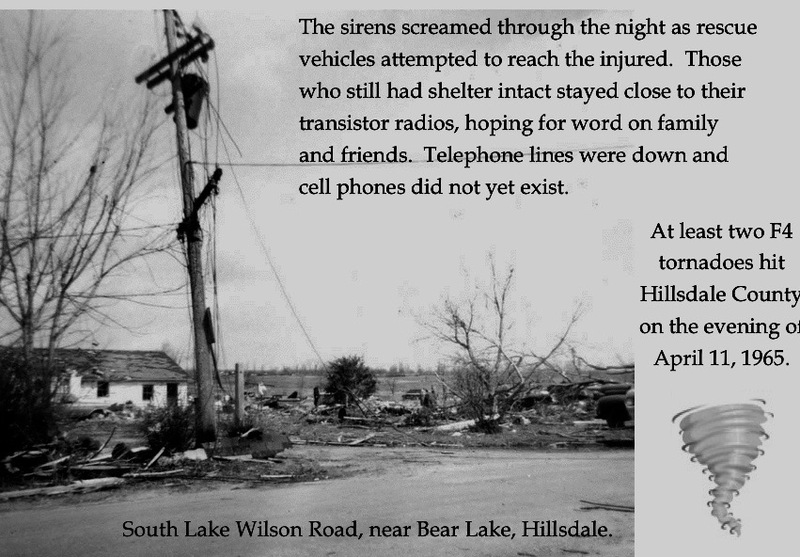 The Bear Lake area in Cambria Township was one of Hillsdale's hardest hit areas during the Palm Sunday tornados of April 11, 1965. Few buildings in this area were spared damage, with a number of people killed and many injured. In some respects the area never really recovered. Fallen trees and debris blocked roads, slowing access to the injured by rescue vehicles. Many areas were without electricity and other necessities for some time. The National Guard was called in to limit access to the devastated areas. Residents were required to carry special identification cards issued by the Sheriff's Office. An aerial reconstruction of what happened on April 11, 1965, done by Civil Defense Director Bud VanHorn and State Meteorologist A.H. Eichmier, concluded that at least four—and possibly five—tornadoes had plowed through hundreds of acres in Hillsdale County. In the Reading/Montgomery area a tornado destroyed in minutes the 27 years of work it had taken to create Kimball Y.M.C.A. Camp on Long Lake. A mile or two away, on Blair Road, the powerful vortex irresistibly sucked two little boys from their father’s arms as he ran with them to the safety of their basement. The twister continued across Cambria Township and M-99 to Ash-Te-Wette Beach Drive. Houses on the shore of Baw Beese Lake were reduced to tinder, while those across the street stood among trees that looked like a spoiled child’s tantrum. Some were on the ground, some with their tops snapped off and some leaning crazily against each other and the houses. Eighty-year-old Mrs. Hugh Norris was just sitting down for dinner in her lakeside home when she heard the roar of the wind. Her house was swept off its foundation into the lake and she had to be rescued by men wading into the cold spring water. In Wheatland Township a tornado struck at about 8:00 p.m. Shocked victims were just coming to grips with what had happened when, 20 to 30 minutes later, a second tornado followed the path of the first. On US-127, Mr. and Mrs. James Poling were blown out of their house and killed by the first tornado. Their sons Roger, age 5, and Dennis, age 3, were found by their uncle Pete Poling when he arrived shortly after with his father, Pearlie. The second tornado hit while Pearlie was still outside looking for James and his wife, and he was killed by a falling tree. Farmers were badly hit; many lost their homes, their outbuildings and their livestock. Fields that soon needed to be planted were covered with debris. Running the family farm was a precarious business in the best of time. When failure was as close as one year of poor crops or one outbreak of disease among the livestock, losing a whole planting season was a sure way to lose everything. the bates home near steamburg road was blown apart in the tornado. The bricks were reunsed to build the new home. an unidentified couple sift through what little remains of their belongings at bear lake. The day after the tornadoes dawned bright and sunny. It seemed to mock the savage destruction on the ground. Stunned people poked aimlessly through their ruined belongings, often brought to a standstill by the weight of what they’d lost. The chaos created by such wide-spread damage made deciding where to start with the clean-up almost impossible. Into the breach, as they always do, stepped the Red Cross and the Salvation Army, letting the survivors know that they were not alone and that recovery was possible. On the advice of Gov. George Romney, who visited the area, the County Commissioners petitioned to have Hillsdale County named an “Emergency Disaster Area.” As such, outside organizations joined the efforts of county residents in the clean-up. The 156th Signal Battalion of the National Guard, stationed in Adrian, arrived to help and to protect against looters (of whom there were very few). Within hours, dozens of volunteers, including high school and Hillsdale College students, made themselves available. Bud VanHorn set up a site at the County Jail, then on Courthouse Square, for volunteers to gather to be given clean-up assignments. Crews worked tirelessly to clear the rubble and search for victims.Through the Red Cross and Salvation Army, as well as local restaurants and grocery stores, food was made available to the people who had lost everything and to the volunteers. Churches across the county served as depots for clothing dispersal to those who had only what they wore when the storm hit. Money donated was used to replace medicine that had been lost. The Industrial Development Commission worked to find housing for those who lost homes, with little luck since so few houses and apartments were available. High school students were organized into crews to help clean up farmers’ fields so that planting could proceed on schedule. With state and national organizations involved, eventually hundreds of people became part of the solution. Heavy equipment arrived and embarked on what Bud VanHorn called “Operation Bulldozer.” Crews cleared debris from sun-up to sun-down, extending that to around the clock when adequate lighting could be arranged. Insurance adjusters flooded the area so that claims could be processed quickly. Even the IRS helped out, giving extensions for income tax payments to those who were affected by the storms. Stories of tragedy abounded after the Palm Sunday disaster. But there was also a reminder that life goes on, even after terrible loss. Mrs. Robert McCready, who was expecting her second child on Easter, and her not-quite-three-year-old daughter, Cheryl Marie, were visiting a neighbor’s trailer with Mrs. McCready’s mother when the tornado struck. At the train whistle sound of the wind, Mrs. McCready threw herself on top of Cheryl Marie, clinging fiercely. She was tossed about and rendered unconscious, only to wake up hours later in the hospital. In order to reach Mrs. McCready her mother and the neighbor had had to move a refrigerator and lift a sink off her legs. Although this left her partially paralyzed it probably also prevented her from being picked up by the wind. She had such a strong grip on her daughter, even in her unconscious state, that her arms had to be pried off. The Red Cross arranged for her husband, who was stationed in Korea in the army, to return home, and two days later their son was born. 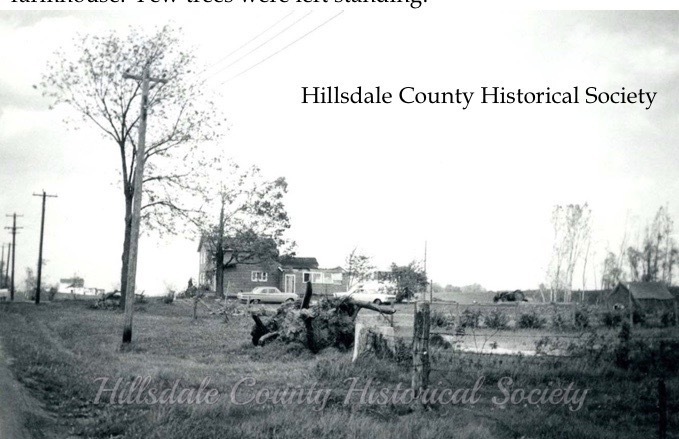 An editorial written by Geneva Gates and published in the Hillsdale Daily News after the tornadoes was entitled “A Stirring Demonstration of Humanitarianism.” In it she recounted the impressive way residents of the county had responded to help their neighbors. It was the most destructive natural disaster to hit Hillsdale County, but it showed how the worst of times can bring out the best in people. On the “worst” side are the devastating facts: 11 dead, over 200 injured, 117 homes destroyed, 111 homes with major damage,14 trailers destroyed or damaged, 98 farm buildings totally destroyed and 532 families affected. But good came from the storm also. Kimball Camp was rebuilt, the new homes along the lake side of Ash-Te-Wette Drive had a more permanent look. Most important, working tirelessly neighbors and strangers alike came together to help those who had been caught in the crosshairs of nature’s fury. An aluminum fishing boat =wrapped around a tree in what was left of five acres of woods on the road back to Lake Wilson. Most of the trees were either twisted or broken off or completely uprooted. It took decades for the woods to regain its former grandeur. The Tom and Jean Brown home on Ash-te-Wette at Baw Beese Lake, following the 1965 Palm Sunday tornado was one of many severely damaged homes. The back of the Ron and Shirley Piddock home on South Lake Wilson Road was blown away, while all the windows imploded. The partially destroyed home in the distance was what was left of the Grimm farmhouse. Few trees were left standing.